I know where all the female teeny boppers are going to be this Friday - the Saugus Mall. I haven't read any of the books, but I've heard that it's wildly popular, but more geared towards a female audience. The storyline is something about a girl caught in a love triangle with a vampire and a werewolf, if memory serves correct. According to an advertisement in the Globe, Robert Pattinson who plays Edward Cullen in the upcoming "Twilight" movie is going to be at the Hot Topic in the Saugus Mall at 6pm on 11/14. Lola, a segment of the Globe, is giving away movie passes if you enter a contest. All you have to do is go to the site (here) and thype LOLA in the promo code box. 25 Readers will win a pair of tickets to the Nov 18th advance screening. It also says to "come dressed as your favorite character from the book for your chance to win even more prizes." Click (here) for a link to Hot Topic with the appearance listings. 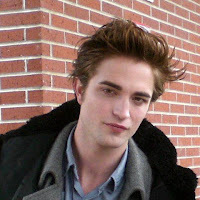 0 Response to "Robert Pattinson Appearance at Saugus Mall - 11/14"
$20 Tickets to the Boston Symphony! Jack & Suzy Welch Lived in Boston? EoD Filming on Rutherford Ave? Cheap Ryanair Flights to Europe On The Way?